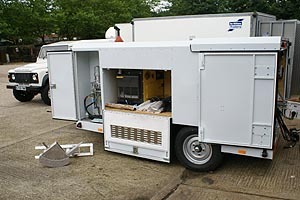 Pipeline inspection vehicle & trailer fitting & conversion services. TC Mechanical Services offers a full vehicle and trailer conversion service. Vehicles and trailers can be fitted for pipeline CCTV camera inspection, lateral cutting and rehabilitation purposes and we can provide a range of long-life battery or diesel power packs. Whether you require a basic panelled Vehicle or a highly sophisticated mobile communications centre, T C Mechanical Services will able to Offer detailed knowledge and high quality Builds to your exact requirements. T C Mechanical can offer systems from the latest battery technology to fully inbuilt diesel power packs , to meet even the most demanding application. All Vehicle Conversions are built using the highest quality materials and with over 20 years experience the most robust of techniques are used to give an operating life in excess of 5 years to maximise your initial outlay.